This recipes produces a well-cooked, meltingly tender duck rather than a rosy bird. If you don't want to make elderberry jelly, the sauce can be made with bought blackberry jelly - or you can omit the sauce altogether and serve the bird with a spoonful of jelly and some pan juices. 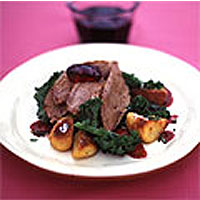 It's great eaten with roast potatoes (cooked in duck fat) and a few greens. Preheat the oven to 220°C/gas mark 7. Wipe the ducks clean inside and out then season inside before stuffing with the thyme and half an orange each. Give each orange half a slight squeeze inside each duck. Prick the ducks' skin and rub with fine sea salt. Set in a roasting tray and put in the centre of the oven for 20 minutes. Remove the ducks and drain off the excess fat. Drop the temperature to 180°C/gas mark 4. Immediately return them to the oven and roast for a further hour, or until the juice runs clear when the legs are pierced at their thickest point, pouring off the excess fat occasionally. This can be used for roasting potatoes. Remove the ducks and set aside in a warm place to rest for 10 minutes. Meanwhile, drain off the excess fat from the pan, taking care to leave the dark juice in the pan. Add the wine, and set over a medium heat. Loosen any sticky bits with a wooden spoon as the wine begins to boil. Boil until reduced by half. Finely grate and juice the second orange and add its zest and juice to the wine along with the elderberry jelly. Continue to reduce until you're happy with the flavour, then season to taste and strain into a jug. Serve with the duck.